Not everyone responds all that well to restrictions, but life is often full of them. 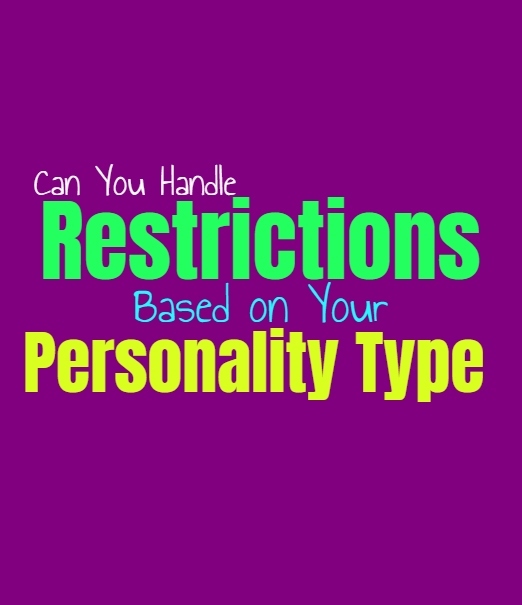 When these people feel themselves being held back or restricted it can leave them feeling frustrated and even a bit rebellious, Here is how you handle restrictions, based on your personality type. INFJs understand that some restrictions exist, and the way they respond to this depends entirely what they are being restricted from. INFJs do often have a bit of a rebellious side to them, but it doesn’t take control in most situations. While they don’t like to be controlled, they also understand that some rules and laws serve a purpose. For the INFJ some restrictions seem like they are pointless to fight, since they don’t affect them all that much. When it comes to restrictions which seem unjust or wrong, the INFJ won’t be okay with this and will often want to fight these battles. ENFJs are often very focused on accomplishing their goals and ensuring that their loved ones are happy. For the ENFJ having anything stand in the way or restrict them from the things they want, can be extremely frustrating. They rarely just accept these restrictions and might even try to find ways to change them entirely. While ENFJs might not want to do anything dishonest to get what they want, they will find ways to make changes and push past these restrictions without being afraid of it. INFPs don’t like being told what they can and cannot do, and so restrictions can be rather frustrating for them. They want to be free to make their own choices and follow their own path. If a restriction doesn’t make sense of seems to be unjust, it becomes difficult for the INFP to really fall in line. They don’t like being someone who just goes with what others tell them to do, instead they want to be their own person. INFPs make their choices based on their inner emotions and morals, not wanting to rely on these rules or restrictions. ENFPs aren’t naturally rule following people and so having certain restrictions placed on them can be deeply troubling. When something does not seem fair or appears unjust, they often want to fight against this. ENFPs prefer to feel free to make their own choices and follow whichever path is in their hearts. For the ENFP feeling restricted from doing what they want and going after their goals, is something they don’t really take without a fight. INTJs don’t like restrictions which prevent them from achieving their goals and getting to the life they want. When these restrictions occur for foolish or unjust reasons, they aren’t afraid of working to change them. INTJs don’t allow things to stand in their way and rarely do they become dettered because of this. They can appreciate restrictions which are logical and make sense, but anything which stands in their path in useless ways, won’t be something they simply accept. ENTJs are hardworking people who focus on working towards the future and life they want. They are often capable of overcome many hurdles, and won’t simply accept things as they are. ENTJs are not afraid of taking on the challenge and will often find a way to overcome this. When the restrictions don’t make logical sense then the ENTJ will do what they must to change them or challenge them in whatever way is possible for them. INTPs don’t really accept most restrictions, since they want to feel free to explore different options. For them feeling restricted is actually a bit exhausting and depressing, since they believe in being able to explore whichever path they want. Restrictions often seem foolish in the eyes of the INTP, and so they aren’t afraid of finding ways around them so that they can accomplish what they want and learn more about the situation ahead. ENTPs don’t like feeling restricted from anything, since they aren’t naturally rule following people. When they can see that they are being held back by unjust or foolish means, they often want to challenge this way of thinking. ENTPs aren’t afraid of going against what others expect and will be willing to fight for what they want. When the ENTP is being restricted they often use their minds to find a way out of this situation and be capable of moving forward. ISTJs don’t really care much about restrictions, especially if they don’t directly affect them. They try to focus on getting things done and of accomplishing their own goals, rather than needing to change every little things around them. If the ISTJ encounters some sort of restrictions, they simply find another way of getting what they need or want. They are practical people who won’t waste their time and energy battling something when they can simply find a way around it in order to accomplish their task efficiently. ESTJs don’t really like feeling restricted when they are trying to get something done, but they often have ways of working around this. For them it is more about being able to accomplish their tasks as efficiently as possible. If the restrictions won’t prevent them from doing this, the it won’t bother the ESTJ all that much. They are practical people who simply want to work hard to get things done and build the life that they want for themselves and their families. ISFJs don’t become all that upset about restrictions or limitations, as long as they don’t harm their loved ones in some way. ISFJs just want to focus on getting the job done and being able to provide for those around them. They are practical people who don’t like becoming all hung up on trying to fight the rules or restrictions set for them. They usually can find ways of accomplishing their goals without these restrictions standing in their way. ESFJs don’t mind most restrictions, especially if they don’t prevent them from getting the job done. They often think about things in a more practical sense wanting to be sure they are taking care of their loved ones and accomplishing their goals accordingly. ESFJs understand that life has restrictions and so they simply work to find ways around these struggles so that they can ensure their loved ones are cared for properly. ISTPs don’t really like restrictions since they have a hard time feeling restrained. When the ISTP feels like someone is trying to restrict them or hold them back, they might want to challenge this. ISTPs don’t care about the restrictions which don’t directly affect them, and are only bothered by the ones which do. They simply want to feel free to follow their own independent path, without constantly having people trying to control them or place demands on them. ESTPs don’t appreciate restrictions if they prevent them from accomplishing their goals or getting them where they want to be. ESTPs can often be spontaneous and adventurous people, who seek to explore their options and live in the present moment. When restrictions prevent them from doing this, they can become severely irritated and want to find ways to bend these rules and work around them. ISFPs can have a hard time really respecting restrictions, since they don’t like being told what they can or cannot do. They are often free spirits who desire a sense of openness and exploration in their lives. If they feel inspired by something the iSFP wants to be capable of exploring this without having someone hold them back. ESFPs don’t like restrictions of any kind, since they prefer a sense of freedom and openness in their lives. They want to be free to make whatever choice they please without having someone try and stop them. ESFPs are not rule following people and so when they feel restricted they often want to fight this or find a way around it entirely. For them it is best to go for what they want, even if this means challenging others.